SUBLINGUAL APPLICATION (sprayed under the tongue) providing a 95% absorption rate of nutrients. Pills and capsules only provide a 10% to 20% absorption rate of nutrients. THIS SUPPLEMENT ACTIVATES your own adult stem cells naturally and strengthens your immune system. As we age our immune system weakens and our ability to absorb nutrients through our gastrointestinal tract reduces. This supplement is specifically designed to combat these challenges. Each bottle contains a 40 day supply. STEM CELL WORX contains the highest grade of natural, pure ingredients and has the greatest number of natural growth and immune factors compared to any other product on the market. These natural growth and immune factors are absolutely vital to initiate the adult stem cell activation processes within your body. All product claims are backed by independent clinical studies. MANUFACTURED IN THE U.S.A. BY a Specialized GMP Approved Laboratory. TIME TAKES ITS TOLL on our own adult stem cells, which decline as we age. It is important we keep them activated. Adult stem cells are our master cells of the body that have the ability to maintain, self-renew and repair cells, tissue and muscle throughout our entire life time. HAVING YOUR OWN ADULT STEM CELLS working at optimal levels provides the platform for many cumulative health benefits. BENEFITS INCLUDE much improved energy, super charges the immune system, supports anti-inflammatory relief and provides rapid repair and recovery after illness, injury and surgery. Renew, Repair and Rebuild. Comes with a money back guarantee. This product is manufactured in the U.S.A. by a leading, long established Laboratory that is GMP certified for liquid supplements and is a member of The Natural Products Association. The actual activation of adult stem cells from the bone marrow is done through the unique combination of these key ingredients and the unique delivery system that Stem Cell Worx Intraoral Spray provides. The bovine colostrum in this dietary supplement contains 20 times more the growth and immune factors than human colostrum, and each spray of Stem Cell Worx contains 100% more IGF growth factors than any other health supplement out in the market, including deer antler velvet supplements. Maximum growth factors present in Stem Cell Worx Intraoral Spray are IGF-1, IGF-2, TGF-alpha, Epidermal-GF, Fibroblast-GF, Platelet-derived GF plus immune antibodies, immunoglobulins, peptides and cytokines. 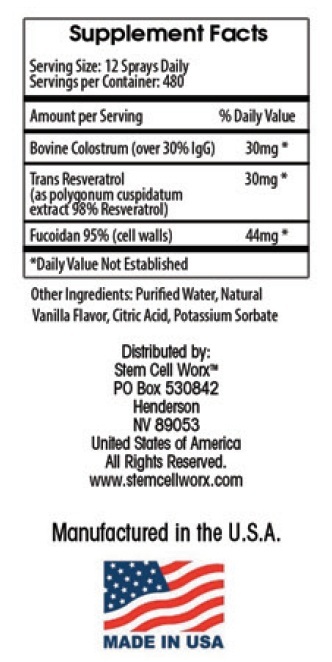 Combined with a pure 98% trans-resveratrol (that supports the enrichment of Mesenchymal stem cells) and a pure 87% Fucoidan (that increases the expression of CD34+ cells) this dietary health supplement is at the forefront of nutritional supplementation. This supplement is also a rich source of magnesium, iron and zinc along with important vitamins such as Vitamin A, B1, B2, B12 and Vitamin C.
It is scientifically proven that the most effective way to take nutrients, to ensure you get maximum absorption, is orally (sprayed under the tongue). Intraoral (also referred to as sublingual) is a viable solution offering an absorption rate of up to 95% of its nutrients compared to just 10% - 20% absorption that capsules and tablets provide. This is because the sub-mucosal membrane (that sits under the tongue) enables nutrients to get directly into the bloodstream, straight away. 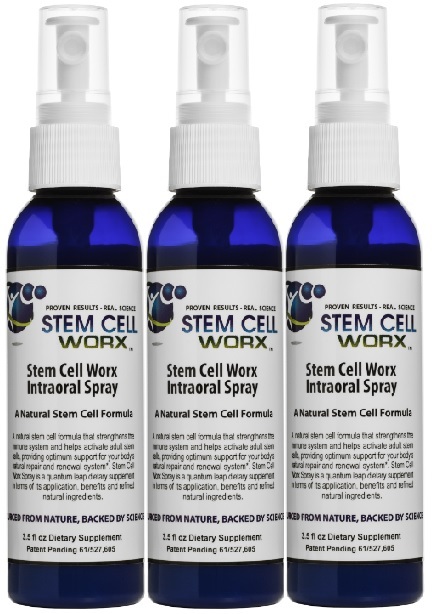 The Stem Cell Worx Intraoral Spray is taken sublingually. Spray under your tongue, hold for 10-20 seconds, then swallow. Take the formulation consistently every day as recommended for 40 days. Each bottle contains a 40 day supply, based on 12 sprays a day. The sprayer is powerful therefore in order to get the correct dosage from each spray, push the sprayer down gently then release. The sprayer should not be pushed all the way down. Keep away from heat and do not store in direct sunlight. In hot climates best stored in the refrigerator.